Project Details "The project is situated approximately 600 km south of Santiago, in the municipality of Santa Barbara y Quilaco in the region of the Bío-Bío River 63 km south-east of the city of Los Angeles; downstream of the confluence of the Bío-Bío River with the Huequecura River, in the gully known as Angoustura del Piulo where the main intake starts. 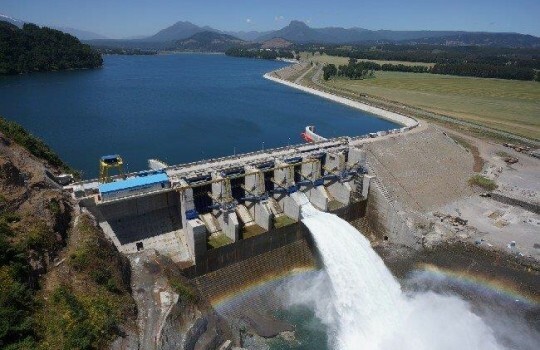 The main civil works include the construction of an earth dam approximately 1.6 km long and 25 metres high on the left bank of the river and the construction of a Rollcrete dam 125 m long and 63 m high with a spillway incorporated along the Bío-Bío River. Why? Explain briefly. Local communities were not involved in the process and were left without affordable electricity for the years following the inauguration of the dam. After a persistent organised mobilisation of social movements, the Chilean government introduced a new law with the aim of equalising the prices between major and minor urban centres two years after the project completion .